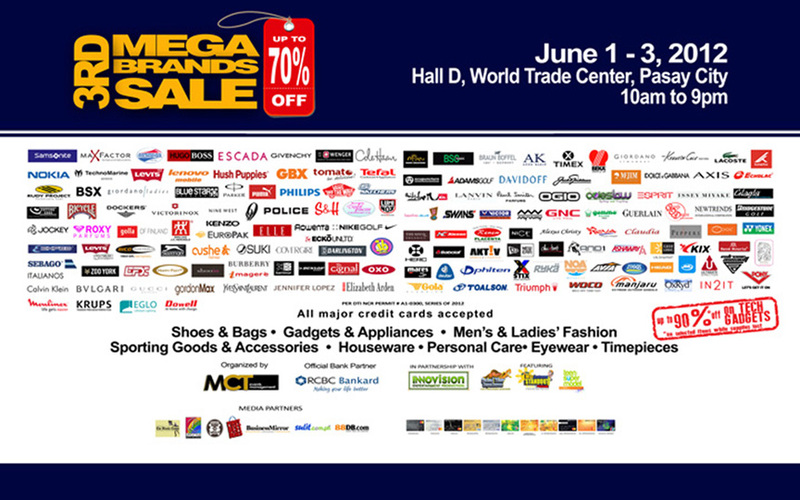 MCT Events Management will hold the 3rd Megabrands Sale on June 1-3, 2012, at the World Trade Center, Pasay City with its official credit card partner, RCBC Bankard. This is a timely Back-to-school and Mid-Year Three-day Sale event. The 3rd MegaBrands Sale will showcase leading brands, both local and imported. You can save up to 70% from tag prices. Huge discounts on bags, gadgets, shoes, ladies and men’s fashion wear, personal care, various housewares and appliances. For those who failed to get their mom’s a present, they can still buy mother rings and father’s day gift to to our beloved dads. There are a good number accessory brands in the sale event too. All major credit cards are accepted. Per DTI NCR Permit # A1-0300 Series of 2012. For more details about the event, please call 643-5490/ 576-6362/ 502-1546/ 399-2935. The 3rd Megabrands Sale is organized by MCT Events Management in partnership with RCBC Bankard and Innovision Entertainment Production! With our media partners: The Manila Times, Business Mirror, WhenInManila.com, Lifestyle Network, PinoyBestDeals.com, Sulit.com, 88db.com and Kikay Corner.